Little is known of the early history of Barbados: it was occupied by Arawak Indians from South America as early as 1600 BC before they were wiped out by the cannibalistic Carib Indians around 1200 AD. This war faring tribe was then decimated with the arrival of the Spanish in the 1400s. While the Spanish, and later the Portuguese, christened the island Los Barbodoes (“the bearded ones”, after the island’s fig trees), it was the British who claimed the island in 1625. By 1663, Barbados was declared a British colony and slaves were brought to the island from Africa to work on the sugar plantations, which rapidly underpinned the entire country’s economy. Barbados dominated the industry until 1720. Slavery was then abolished in 1834 but many freed Bajans returned to work as paid labourers for the former employers. During the early 1900s, the establishment of trade unions gave workers more rights, but the Great Depression of the 1930s led to soaring unemployment, riots and British financial aid. Gradually, Bajans started to demand their own political rights, leading to the election of Errol Walton Barrow as the island’s first prime minister in 1962. Barrow led Barbados to independence four years later. Since then successive governments have tried to help diversify the economy and propel development. However, the country’s sugar industry has declined and the agriculture industry has follow suit. Tourism has picked up the slack. 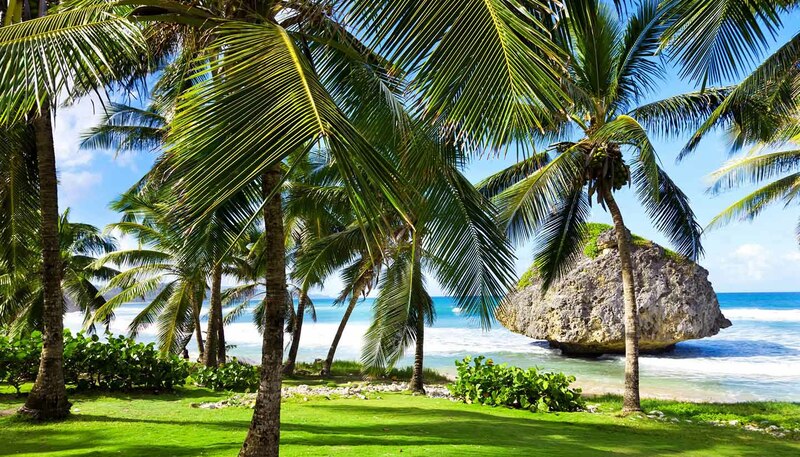 Barbados has a highly developed tourism industry, though it did take a knock after the recession in 2008, reminding islanders of the vulnerability of pinning the economy’s hopes on one industry. Meanwhile, the island’s offshore banking and financial services sector has grown. In the 2008 election, David Thompson of the Democratic Labour Party (DLP) assumed office as prime minister from the Barbados Labour Party, which had been in power for 14 years. Thompson pledged to focus on domestic issues, particularly the cost of living, healthcare, and crime. His successor, Freundel Stuart took over in 2010. •	Drink driving in Barbados is still not illegal. •	Barbados is known as the “land of the flying fish” due to the ubiquity of these creatures in its waters. •	In Barbados it is considered good luck if a mongoose crosses your path. Over 100 religious groups practise island-wide, from the Anglican majority to smaller Roman Catholic, Jewish, Hindu, Baptists, Pentecostals, Seventh Day Adventists, Jehovah's Witnesses, Mormons, The Salvation Army, Muslim and Quaker faiths. Many British societal attitudes permeate bureaucratic red tape and architecture, yet when it comes to time-keeping, humour and urgency the laid-back Barbados manner reigns supreme. Barefoot casual attire is de rigour except when dressing up-to-the nines for dinner - or church. As a former slave colony, personal freedom is highly valued. The official language is English. Local Bajan dialect is also spoken.